In January 1981, Hill Street Blues debuted on NBC and quickly became college dorm appointment viewing among my circle of friends. Set in an unnamed large city, the series focused on the police squad of the Hill Street precinct. Despite poor ratings the first season, the series received positive reviews, won several Emmy Awards and was renewed. It lasted for 146 episodes through May 1987. In 2014, the complete DVD set became available. The style of Hill Street Blues was vastly different from the police shows of the time. The series used multiple storylines, several of which carried over to subsequent episodes. Many scenes featured background voices and other noises. Sometimes you had to really concentrate to follow the main dialogue though all the commotion. The show filmed action from non-traditional locations such as the men's bathroom at the station. Some scenes were dimly lit. Producers used many closeup shots from handheld cameras and often rapidly switched between camera angles. These techniques provided a more realistic feel, gave a sense of the chaos on inner city streets, and helped depict the dangers faced by the men and women in blue. The innovative series was created by Steven Bochco and Michael Kozoll. In this interview, Bochco discusses various aspects of the show including the parallel storyline concept, casting decisions, and the pilot episode. He also talks about another iconic feature - the awesome piano theme music written by Mike Post. Hill Street Blues covered topics such as police misconduct, racial tension, office politics, and ethical quandaries. The show also spotlighted the personal lives of the squad members and masterfully developed these characters over time. Many themes focused on personal demons - alcoholism, gambling, infidelity, depression. Each episode would start in the morning and cover a single day. The show opened with the morning roll call which was conducted in the early seasons by Sergeant Phil Esterhaus (Michael Conrad). Esterhaus would speak in a distinctive slow-paced voice interspersed with eloquent language. He would always conclude with a version of his signature phrase "Let's be careful out there!". Daniel J. Travanti played Captain Frank Furillo who exhibited a calm demeanor in dealing with each crisis that arose. 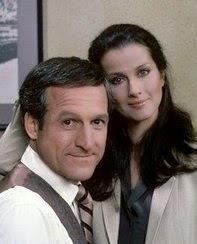 A primary story line in season 1 was his intimate relationship (secret at the time) with public defender Joyce Davenport (Veronica Hamel). They formed an intriguing couple as their respective jobs sometimes pitted them as adversaries. Another interesting dynamic was how Frank was constantly juggling interruptions from his ex-wife Fay played by Barbara Bosson. The show illuminated the bonds between regular police partners. I liked the chemistry of the Bobby Hill pairing with Andy Renko. Similarly, I was fond of the tandem of Joe Coffey and the strong female character Lucy Bates. Ironically, the initial pilot script called for Hill and Renko to die during a shooting, and the original intent was to kill off Coffey after a few episodes. Fortunately, plans changed allowing these excellent on-screen partnerships to flourish during the run. (Coffey was killed off during a shooting in season 6 and the impact on Bates was a key plot element). Two of its actors had a major sports background. Mike Warren (who portrayed Hill) played basketball at UCLA and was a starting guard on the 1967 and 1968 national championship squads. Ed Marinaro (who played Coffey) was a running back at Cornell and finished second in the 1971 Heisman Trophy voting before playing parts of six seasons in the NFL. 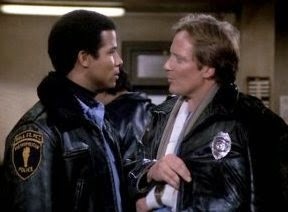 Several episodes spotlighted the rather friendly working relationship between police officers and gangs. One aspect I found fascinating was the negotiations between police and gang leaders over terms such as turf boundaries. One gang leader was played by David Caruso who later served in the lead role in the Bochco series NYPD Blue. One episode featured a benefit basketball game between police and gang members which gave Warren a chance to show off his talent on the court. The series used a lot of slang and pushed some boundaries with language - for example, many subtle sexual references and allusions to other bodily functions. The show also featured some quirky characters - most notably detective Mick Belker (who often referred to suspects as "Hairball" or "Dogbreath") and aggressive SWAT team leader Howard Hunter. Hill Street Blues was cleverly written and brilliantly casted. It was entertaining, educational, intense, and downright hilarious at times. Above all, it was riveting and drew me to subsequent Bochco series such as LA Law and NYPD Blue (and even the short-lived Bay City Blues). This post is part of a Classic TV Detectives Blogathon hosted by the Classic TV Blog Association. Please check out the complete schedule of blog posts for this event. HILL STREET BLUES was certainly an influential show, with its large cast and interlocking stories. It seems as if its success begat ST. ELSEWHERE, L.A. LAW, and later E.R. I thought Daniel J. Travanti was perfect for his role and was the glue that held it all together. I was always surprised that he didn't find success in a follow-up TV series. I was wondering about the sports connection: I'd forgotten about Ed Marinaro playing football (which is lame) and didn't even know that Mike Warren played basketball! Thanks for an informative post on a true classic. Thanks, Rick. I agree on Travanti. Interesting how virtually every main cast member is best known for his/her work on HSB (or on another Bochco series). And I guess it is a testament to the acting skills of Warren and Marinaro that their respective sports careers are a somewhat forgotten footnote. Travanti's career decline after Hill Street is simple: He became a jerk when bestowed with this success. Save for one short-lived series (Missing Persons), no one would hire him in light of his reputation of being difficult. Some of my favorite TV characters are found in this series. Thanks for the reminder. Must-see TV for me and my late father. We'd be so caught up in the story that the sound of the piano theme signalling the end of the evening's episode always came as a surprise and a disappointment. Thanks for the comments. I listened to the theme music while writing my post. A great write-up on an interesting show that has had almost no TV afterlife. The very quality -- it was complicated in many ways, plot-wise and cast-wise -- that made it perfect as a breakout network show made it unsuitable for 5x a week strip syndication. Certainly a game-changer! Thanks, Lisa and good points. It's been quite a while since I've seen HSB in syndication. Found your article while enjoying the show's third cycle in repeats on the over-the-air channel Heroes & Icons. :-) Have watched each one. Great piece, Jeff. I was just reading about Hill Street Blues the other day - a review from its first season - and the critic was struck, approvingly, by how realistic the precinct house was. It reminds you that most detectives don't get to purchase fashionable lofts in Manhattan, but that police work can be grimy, depressing, frustrating, tough - and yet satisfying - work. Thanks, Mitchell. Yes, the detectives at Hill Street station always seemed to be in cramped spaces surrounded by constant commotion.